In 1912 a revolution had deposed the Emperor of China and a republic was proclaimed. By 1916 there were two governments claiming to speak for the people, one at Peking, the other at Canton. There were also many War Lords waging their private vendettas. From 1922 the Southern Regime took a definitely Communist and anti-foreign tone which was directed chiefly against the British as the largest foreign holder of property in China. This was the background in 1926. The two armies were approaching each other in the neighbourhood of the Yangtse - Kiang River. By the end of the year Shanghai was in danger of capture. The International Settlement occupied nine square miles. It was the wealthiest port in China and British interests were greater than those of the other powers. In January 1927 the British Concession in Hankow, a city and port on the Yangtse, had been invaded by a mob and British residents had to take refuge in a cruiser. In Shanghai there were the police backed by the Shanghai Volunteer Corps of approximately 1,500. The total was quite insufficient to provide a 12 mile cordon round the International Settlement. Under these circumstances the Commander in Chief, China Station, asked the British Government to send one Division to Shanghai to secure the safety of the Settlement and to protect British property. Three brigades and some armoured cars were sent out very promptly. An infantry cordon was established; Armoured cars patrolled between the posts on the cordon line. The danger abated and finally disappeared without any serious fighting. 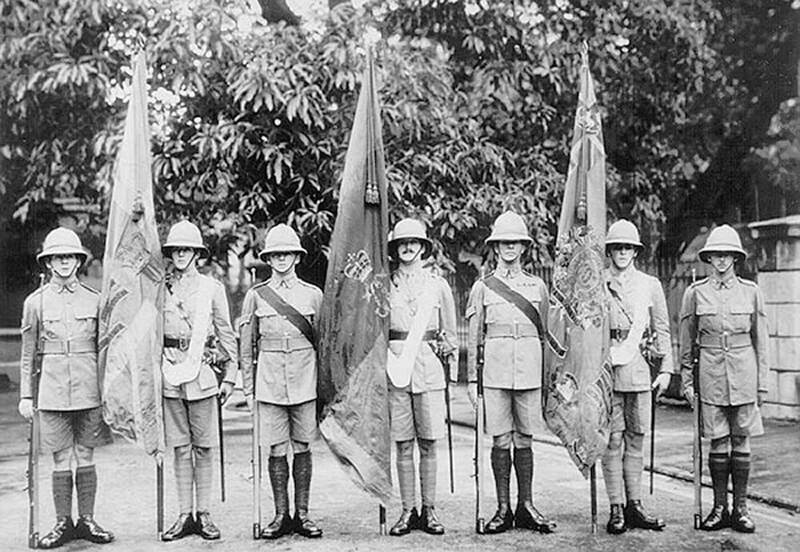 Before the end of 1927 it was possible to withdraw most of the force, and the only permanent result was that a British battalion would garrison Shanghai in the future. Meanwhile the 1st Bn The Queen's Royal Regiment were going about their garrison duties in Dover, little knowing what adventures were lying ahead. The newspaper headline 'The Guards for China' was considered to be serious because at that time the Guards never served East of Suez! The first defensive precaution occurred on January 22nd 1927 when the Shanghai Defence Force was formed in London. Eighteen Queensmen were chosen to accompany the Force in varying capacities and an officer was posted for cypher duties. The Battalion interest in China became academic and life in Dover resumed its normal course until 1st April, when late at night the Orderly Room sprang into sudden activity. The duty bugler sounded the Alarm and it was soon evident this was not an April's Fool's Day hoax! In less than two weeks the Queen's had sailed in HMT Nevasa from Southampton for an unknown destination. The ship called at Port Said and put into Colombo to coal. The Battalion saw the East for the first time, as a day was spent ashore. The next stop was Singapore. The approach to the port was very beautiful and the harbour was full of shipping from many nations. It was now learnt that the destination would be Hong Kong, and the Island was reached on 16th May 1927. It was a typical early summer day with very high humidity and the Peak, 1,500 feet, overlooking the harbour was covered in cloud. On disembarkation the Battalion was dispersed to various locations, Headquarters and HQ Wing were in Wellington Barracks; opposite in Victoria Barracks were B and D Companies, while A Company was out at Lyemun, with C Company in a converted garage in Happy Valley. While the original plan had been for the Battalion to be part of a Brigade at Tientsin, with the situation improving, it was not required to continue the journey, and soon the Battalion settled down to garrison life. Victoria was already a modern city with trams and taxis supplementing the one man rickshaws, and the funicular railway ran up to the top of the Peak. Harbour life was teeming with the ferries, junks and sampans. There were ample opportunities for sport and recreation of many kinds, including sailing, rowing and fishing. On arrival the Battalion had been welcomed by Lt Col F Hayley-Bell, DSO., who had commanded the 10th Battalion of the Regiment in the 1914-18 War and who was Chief of the Chinese Maritime Customs. He was able to give much advice and help and arranged many visits for all ranks to outlying islands in his personal launch for picnics. On 3rd June 1927, on the orders of Lt Col R G Clarke, CMG., DSO., the Third Colour was carried in the King's Birthday Parade. This was in contravention of King William IV's ruling that the Third Colour was not to be displayed in the ranks of the Regiment. The old six foot Colours made a fine sight and no official exception was taken to the presence of the Third Colour. On 9th July the Commanding Officer granted the Battalion a day's holiday on the occasion of the 88th anniversary of the Presentation of the Colours then in use. These Colours are now displayed in the Museum at Clandon. Among the duties to be undertaken in Hong Kong, one of the most popular was the anti-pirate guard on merchant ships. The South China Sea has always been notorious for pirates, who at this time used to disguise themselves as civilian passengers and then hold the Captain and the ship to ransom and relieve the passengers of their valuables. This took place on ships between Hong Kong and Shanghai and on the river boats up the Yangtse and up to Canton. Most of the ships to be guarded were those of the China Navigation Company, which covered also other coast ports like Swatow and Amoy, and were of about 3,000 tons. Much more looked forward to were duties on the big 'Empress' liners of the Canadian Pacific Railway Line sailing between Shanghai and Hong Kong. 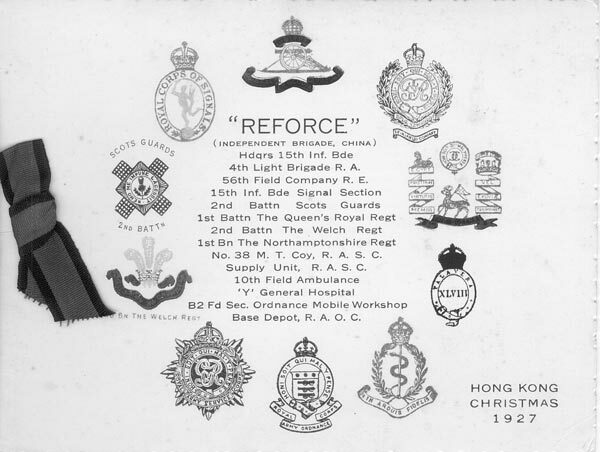 Training in Hong Kong was varied with much emphasis on shooting with a new classification schedule to be fired, while in March 1928 a new organization of the Battalion was adopted with A Company being converted to a Machine Gun Company. 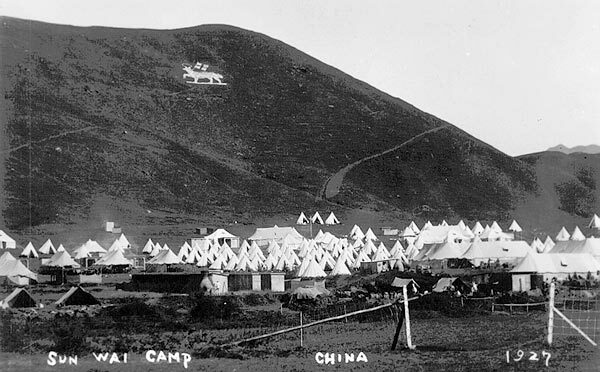 This training took place in Sun Wai Camp in the north of the New Territories, and in the surrounding hills a very large Paschal Lamb cap badge was painted. Unfortunately this did not survive the Japanese Occupation from 1941 to 1945. While the training in the New Territories was good, there could be health problems, with forty cases of malaria occurring in 1928. On 27th May 1928 Colonel Hayley-Bell unveiled a memorial tablet in the Lady Chapel of the Cathedral of St John the Evangelist. The Tablet was inscribed 'Erected by all ranks 1st Bn The Queen's Royal Regiment while serving in China 1927-28 in memory of the two officers and 25 Other Ranks of the 1st Battalion who were killed on Active Service in China in 1860.' 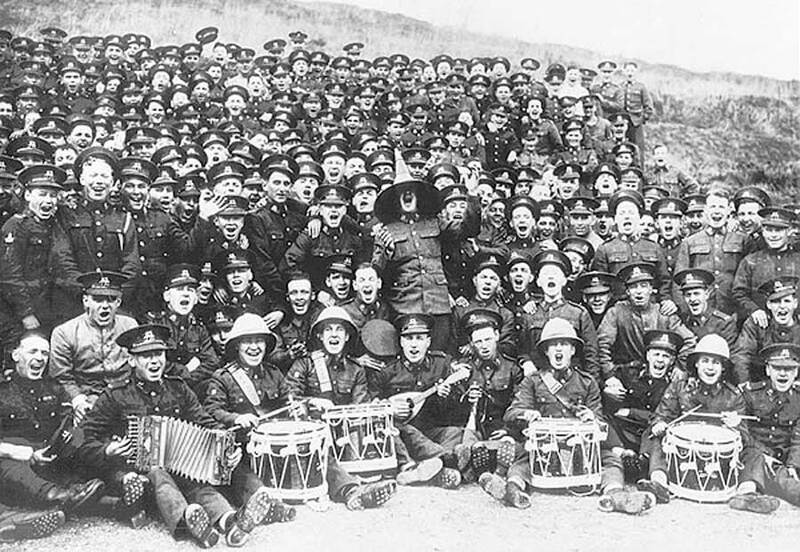 The Battalion paraded 450 strong with a detachment of 120 men from the 1st Bn The King's Own Scottish Borderers. As 1928 wore on, warning was given of a move early the next year and before leaving, the Battalion organized a grand tattoo in aid of military charities: this involved over 400 men. Eventually after some delay, the 1st Bn The Somerset Light Infantry arrived and on 2nd March 1929 the Battalion, now under command of Lt Col H C Ponsonby, DSO,MC, embarked in the troopship Somersetshire for Malta. The departure from Holt's Wharf, Kowloon was marked by dense crowds, three bands and two pipe bands and a splendid show of fireworks and crackers. Hong Kong had proved a friendly and hospitable station. Malta would be nearer home and the families would be rejoining the Battalion.